Ducati won their home GP earlier today, where Andrea Dovizioso crossed the line first at Mugello. Dovizioso was very sick this morning with food poisoning and did not participate in the warm-up. Nevertheless, he ran with the front group the entire race. All the Ducati riders had a distinct advantage on the notoriously long front straight at Mugello, Dovizioso included. Crossing the line in second place was championship points leader Maverick Viñales (Yamaha) with Danilo Petrucci (Ducati) finishing third, just ahead of fourth place Valentino Rossi (Yamaha). With the victory, Dovizioso moves into second place in the championship, 26 points behind Viñales. Follow this link to full race results. For additional details and points, visit the official MotoGP site. for the record Ross did at least TRY to put on a good showing for the home team. no, he wasn’t able to feature on the podium, but for someone supposedly injured…? he DID “feature”. oh, and lest we forget his special #469 Nicky/Mugello helmet. Sorry, just had to say it after seeing the replay… Great respects paid to Hayden yesterday… was very great to see that. Guy Martin’s Honda gearbox failed in yesterdays TT Superbike race leaving him with a box full of neutrals coming into a fast 130mph corner. He was in 6th, needed 5th to slow the bike for the corner and – nothing. Guy went into the wall. The interview at the end of the day with Guy was revealing. I’ve never seen Guy that shook up. John McGuiness is injured and lucky to be alive after his Honda failed in the North West 200. What’s happened to Honda? Failing in Moto GP, failing in Superbikes, failing in F1, failing in Indy (Alonso). Even their HondaJet was 10 years late and needed rescuing by GE. Not the company they once were. Simply Mr.Honda passed on nearly three decades ago.Also the company that bears his name has morphed into a place the Mr.Honda himself could never be employed by. Because other brands don’t have technical failures in racing.. Isle of Man is different than any other motorcycle race. 60+ seconds at a time in 6th gear bouncing off the rev limiter on a superbike? Remember when they stopped racing superbikes in the Daytona 200 because they had a couple of tire failures? The thing about motorcycle is, on a long enough timeline, almost everybody is injured into retirement or dead. Honda failing? really? Honda powered car won the Indy 500. Honda has won 3 out of the last 4 moto GP world championship’s including last years. Honda has won all but one of the this years Moto 3 races. Are you expecting them to be perfect? How many current members of the Repsol Honda MotoGP Team worked directly and/or indirectly with our dear departed Nicky Hayden? Did Nicky’s untimely demise have negative effect on Team Repsol this weekend? MM @ #5 and Pedrosa crashing, taking out Cal Crutchlow, is not Repsol Team SOP. Is Cal Crutchlow not the great British actor Kenneth Branaugh’s doppelganger? The resemblance is uncanny. Nobody does Pissed Off like Helmet Hair does Pissed Off. Hahaha! Oh yeah, Cal’s got some hair! Just kidding…Cal seems like a good “bloke.” Getting to enjoy the British announcers’ lingo, you know, “bonnet, boot,” etc. Hated seeing Cal go down like that. Man, I had a major crush on Branaugh’s ex-wife Emma Thompson. Yeah, I’m old! Hahaha! Cal’s not worried about thinning hair, yes? Enjoying the British announcers’ lingo during the game, you know, “BONnet, boot, GAY-raj,” etc. Man, I had a major crush on Kenneth Branaugh’s ex-wife Emma Thompson. Yeah, I’m old! Really, I wonder if Crutchlow and Branaugh are related. Except that Cal is 35 years Kenneth’s junior, they look very similar. Anybody know of a site past motogp races can be streamed from? I’d really like to watch this one. If you mean for free, I don’t know of any. The only legit place I know of is from MotoGP.com. At one time, you had the option to buy the coverage per race in case you didn’t want to spring for the full season or remainder of season pass. That might still be an option. If the Moto2 and Moto3 races are bundled with that, they are so worth watching, too. You can buy a single race pass from the MotoGP website for the equivalent of about $11. I think you actually get access to all past races for like two or three days, so it might be wise to aside some binge-watching time. If you meant free streaming, I don’t know of any. The only legit way I know of is to pay for a subscription to MotoGP’s site. Sometimes you can find some really low res camera pointed at tv type coverage of races on You Tube. For free that’s about it, the others are correct about the moto GP site. might as well shell out. you can watch Nicky on the V5 backing it in in Assen in that battle with CE2 circa ’06. one of my personal recommendations. Three (excellent) Grand Prix races in Mugello, Italy, and three Italian winners, with one on a Ducati to boot! They must be going nuts in Italy right now. The only thing that could have made the Italians happier is if Rossi could have mugged Lorenzo before the race, jacked his Ducati and won the race on it with Dovi and Petrucci in tow. Lorenzo had a really bad rear end shake when he was hunting with the leaders and then fell back after that. He seems only to do well when no rain or when everything is perfect. Dov also had a really bad rear end shake but pushed through it and won. I thought the same thing. Totally thought that was Lorenzo. OMG, I looked again….you’re right! Weird! I also thought that was Lorenzo. I said it before-BAUTISTA! and crutchlow’s race lasted .61 seconds longer than pedrosa’s? that’s accurate timing. on-board shots down the straight both forward and backward were AWESOME!!! oh yeah, what’s in that damn “secret box” under the tail of the GP17…? LOL is it just for aerodynamics…? who knows. arghh, those summummabitches, I KNEW IT…!!! Silly Tim, it’s “personal pan pizzas” in there man! It’s MotoGp, they gotta always go with the lightweight option. 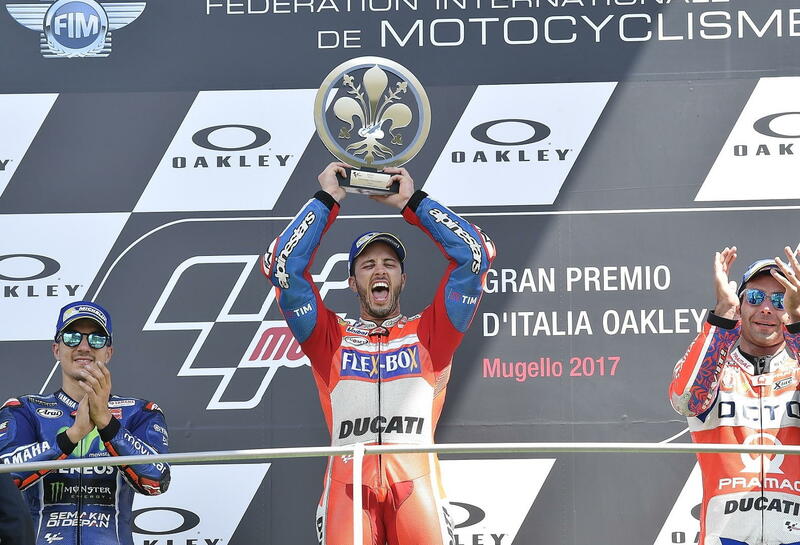 Dovi seems to be a real class act. I think he’ll sell more Ducatis than Iannone would have. Dovi rode a great race yesterday! But who is to say that Iannone wouldn’t be second in the championship had he stayed with the factory? With more points even?